Shuttle engine's main combustion chamber liner of NARloy-Z is surrounded by special plastic shield for electrodeposition of copper barrier. The world's most advanced rocket engine depends on copper and copper alloys. Three of these powerful engines are used in each of the four space shuttles built for the U.S. National Aeronautics and Space Administration (NASA). "Copper and copper alloys play an important role in all NASA space flights," according to R. Jeffrey Ding, project engineer at the George C. Marshall Space Flight Center in Huntsville, Alabama. 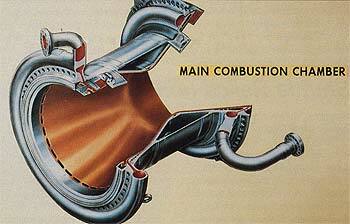 "During flight, the space shuttle main engines generate tremendous heat. Dissipating this heat is essential to maintaining the integrity of the engines. Copper is one of the most desirable metals for this requirement," says Ding. The three main engines are located at the tail end of the shuttle craft (orbiter). They work together with two solid-fuel rocket boosters to overcome earth's gravity during the initial ascent into orbit. The two boosters fall away after about two minutes of the eight-minute twenty-second ascent, leaving the three engines as the orbiter's propulsion system for the duration of the flight. The space shuttle has relied on these reusable, throttle-controlled copper engines for all its manned flights. In operation, the engines' main combustion chambers contain the burning propellant (hydrogen) and approach temperatures around 6,000F. 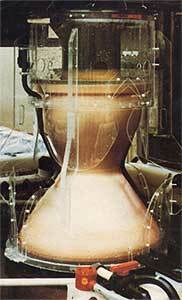 Despite these severe operating conditions the chamber liners must remain structurally sound for repeated use. Careful material selection and fabrication was critical. The chamber liners are made from a copper alloy called NARloy-Z (96% copper, 3% silver, 0.5% zirconium) developed by North American Rockwell (now Rockwell International Corporation). NARloy-Z has superior heat transfer properties, excellent resistance to corrosion and oxidation and is not susceptible to any form of hydrogen embrittlement. In its cast and machined condition, the liner is 17 inches long and weighs 1,450 pounds. It has an outside diameter of 22 inches and an inside diameter of 12 inches. Following hot roll contouring and extrusion spinning at elevated temperature, the liner approaches 2 feet in length and takes on an hourglass shape about 5 inches thick. Some 390 coolant channels are machined into the wall of the hourglass-shaped chamber and then closed out by an electroforming process which deposits a smooth, pure copper barrier between .003 and .010 inches thick. The hydrogen fuel is circulated through these channels to keep the engine from overheating and simultaneously to preheat the fuel for combustion. A coating of nickel is then electrodeposited on the liner. The copper film provides a barrier between the nickel coating and NARloy-Z to prevent hydrogen embrittlement of the nickel. Fabrication of the combustion chambers is a painstaking three to four year process that requires the joint efforts of three companies. Special Metals Corporation, New Hartford, New York, formulates the NARloy-Z material and vacuum centrifugal casts the ingot. Schlosser Forge Company of Cucamonga, California, performs the forging operations and Pacific Metal Craft, Los Angeles, California, extrusion spins the forging into the raw hourglass shape. The Rocketdyne division of Rockwell International, located in Canoga Park, California, completes the combustion chamber and assembles it into the shuttle's 12-foot tall main engine. The unique engine is hot-fire tested at the Stennis Space Center before being installed into the 184-foot shuttle at the Kennedy Space Flight Center in Florida. extensive copper coating to protect against hydrogen environmental embrittlement. "In view of the performance and engineering requirements defined at the beginning of the space shuttle main engine program, copper and copper alloys were essential to achieving optimization of those requirements," NASA engineer Ding says. NASA shuttles include: Enterprise, Columbia, Discovery, and Atlantis. The George C. Marshall Space Flight Center is a field center for the National Aeronautics and Space Administration, functioning chiefly as a research and development center for propulsion systems. Also located at the Marshall Space Flight Center are the project offices for the space shuttle's vehicle systems.